This is a vegetarian dish that has wonderful fresh flavor. This menu for vegetarian and most famous of Thailand, it’s easy for cooking and delicious. And then use in period Kin Jay festival. That is good idea for Vegan. 1. Soak noodles in 8 cups cold water for 45 minutes. Drain in a colander and set aside. Heat vegetable oil in a large skillet over high heat. 2. Add garlic and sauté, stirring, until lightly browned, about 1 minute. Add broccoli, onions, snow peas, celery, carrots, bell pepper and mushrooms, and stir fry for 1 minute. 3. Add peanuts, fish sauce, Chile paste, vinegar, soy sauce, pepper powder andamp; noodles, and cook, stirring continuously, until heated through and well mixed, about 2 minutes. 4. Stir in chopped mint. Transfer to a platter, sprinkle with bean sprout and leeks and garnish with mint sprig. 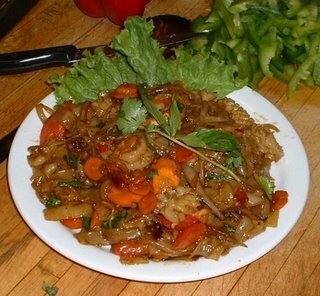 Enjoy your cooking for Thai Vegetarian food. Thank you for your comment, may be I forget change to soy saurce.